We are offering a premium range of IR 36 Raw Rice . The rice is triple polished, double silky, sorted and broken. It is ideal for preparing many authentic Indian delicacies. 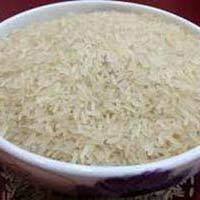 We are one of the leading Manufacturers and Suppliers of IR 36 Raw Rice from Madhya Pradesh. We process the rice in a very hygienic way and assure that our IR 36 Raw Rice is free from harmful chemicals and pesticides.